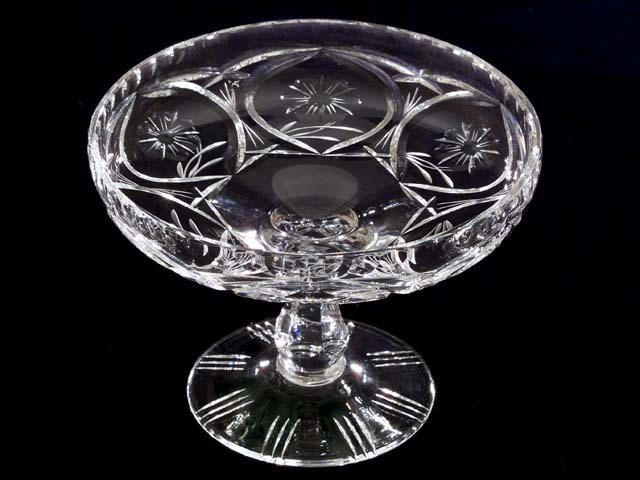 Round crystal tazza or compote, has a bright clear tone when tapped. It is 7 3/4" diameter X 5 1/2" tall with a bowl depth of 1 7/8" at center and 3/16" thick at the lip which is fluted on the outside edge. Base diameter is 4 1/2" X 1/6" thick. The bowl is decorated with six 12 petal flowers with stem and three leaves, petals alternating wide and narrow each flower surrounded by a deep cut vesica.